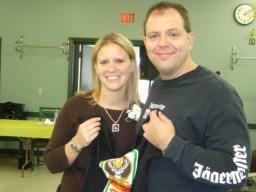 Fritz presents Shannon with an FPB/Jager t-shirt at the conclusion of FPB's gig on October 28, 2007 in Wampsville, NY. 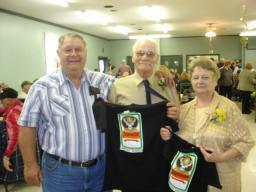 Fred presents a couple of FPB/Jagermeister t-shirts to Val and Judy Seitz, at Val & Judy's 50th anniversary party that FPB played at on October 28, 2007. 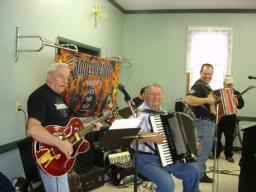 FPB cranks out a tune during the third set of October 28th in Wampsville, NY. 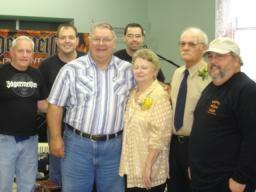 The guys in FPB are pictured here with Judy & Val Seitz on October 28, 2007, as FPB performed for Judy & Val's 50th Anniversary Party. FPB rips through a tune during their gig at Vapor at Saratoga Gaming & Raceway on October 27, 2007 in Saratoga Springs, NY. 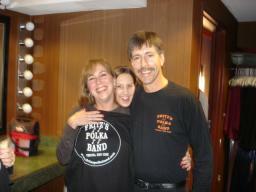 At the conclusion of FPB's gig at Vapor at Saratoga Gaming & Raceway on October 27th, Fritz is shown here with his college pal, Lurch along with Lurch's wife, Christine. Lurch and Fritz attended college together 17 years ago. 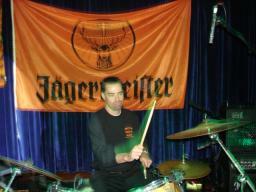 Rick (with a mysterious green glow) drums during FPB's second set on October 27, 2007 in Saratoga Springs, NY. 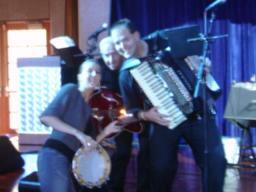 Tom and Fritz lean toward Kim, as she gets ready to play a tambourine during FPB's rendition of 'Old Time Rock And Roll' on October 27th in Saratoga Springs, NY. 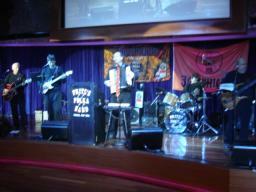 As the big video screen above the stage displays FPB's performance, the guys are shown here tearing through a tune on October 27th. 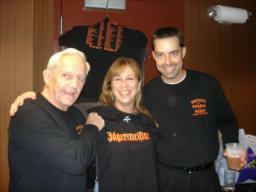 Tom and Rick pose with Linda on October 27th, as Tom helps her hold up her new Jager stretchy shirt. 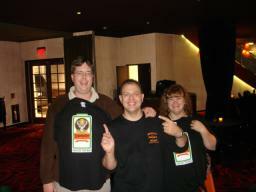 Linda and Frank smile while Kim makes her best goblin face at Vapor at Saratoga Gaming & Raceway on October 27th. 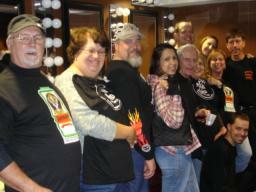 Charlie, Fran, Don, Camille, Patty, Kim, and Linda pose with Tom, Fritz, Rick, and Frank, during FPB's intermission on October 27, 2007 in Saratoga Springs, NY. 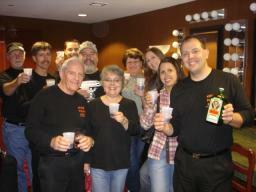 Frank, Rick, Tom, and Fritz tip some Jager with their friends during intermission on October 27th in Saratoga Springs, NY at Vapor at Saratoga Gaming & Raceway. 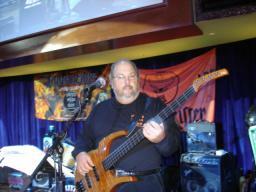 Gabe with his Parker bass on October 27th in Saratoga Springs, NY during FPB's first set of the gig. 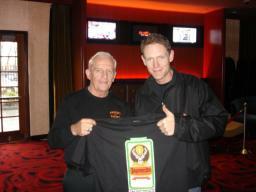 Tom presents an FPB/Jagermeister t-shirt to Brian, prior to the start of FPB's gig at Vapor at Saratoga Gaming & Raceway on October 27th. 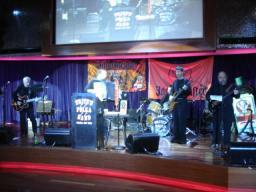 Brian did a great job running sound for FPB at Vapor!